I like the original floating island bath melt and i wish they would have kept that style and this one. That one was more foamy and creamy. However, i will say that this new bath oil style is more moisturizing than the original cupcake style Floating Island. 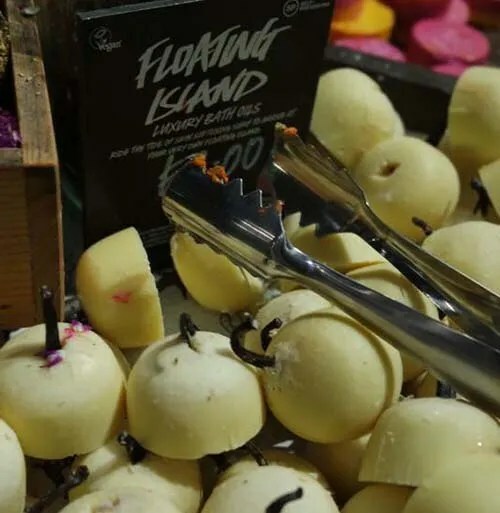 Floating Island has a lemon and sandalwood scent. It’s the same scent as the lush bath melt of the same name. Lush also made a shower smoothie with this scent called “Whitewash”. The scent in this bath oil is stronger, really nice. It’s a subtle scent though, don’t expect a big bold fragrance. Very very moisturizing to my skin in the bath. This is great for people with dry skin. A round, solid bath oil. Since April 2015 this has only been available if you lived in London and could go to the new Oxford Street ‘superstore’. Now it is available on the lush.co.uk site for anyone to buy no matter what country we live in.